… In 1978, nearly three in four teenagers (71.8%) ages 16 to 19 held a summer job, but as of last year, only about four in 10 teens did, according to data from the Bureau of Labor Statistics for the month of July analyzed by outplacement firm Challenger, Gray & Christmas . It’s been a steady decline, seen even during good times: During the dot-com boom in the late 1990s, when national unemployment was only about 4%, roughly six in 10 teens held summer jobs…. And they are not very interested in getting jobs. Only 8.3% of teens who were not working last summer said they even wanted a job. This doesn’t mean that teens are simply tanning by the pool or binge-watching Bravo (though some certainly are). Challenger says that many teens are in summer school (rates of summer school attendance are at one of the highest levels ever, he says), volunteering, doing extracurricular activities to pad their college applications and trying out unpaid internships. And all of these are worthwhile endeavors (well, minus the tanning and Bravo), especially as it becomes more competitive to get into many elite colleges. Lack of work experience can be a disadvantage. One of my older relatives had a job in high school delivering both the morning and afternoon newspapers. He and a friend would rise early each day to roll up and deliver papers before their first class, and then repeat the routine after school. He was also in the school band, played varsity tennis, and maintained good grades, clearly demonstrating he was able to manage his time effectively. A generation or two later, it’s hard to imagine many kids successfully maintaining a similar schedule of activities. Many of them need reminders to take their Adderal in the morning, and think they are too busy for a part-time job. Maybe my relative was a remarkable young man, but many of his peers also worked during high school. Times have changed. Expectations have changed. Kids have changed. 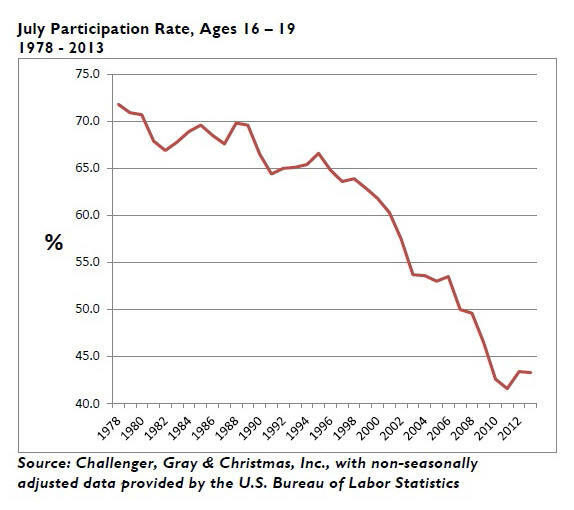 Catey Hill, “American teens don’t want to work”, MarketWatch, May 3, 2014. 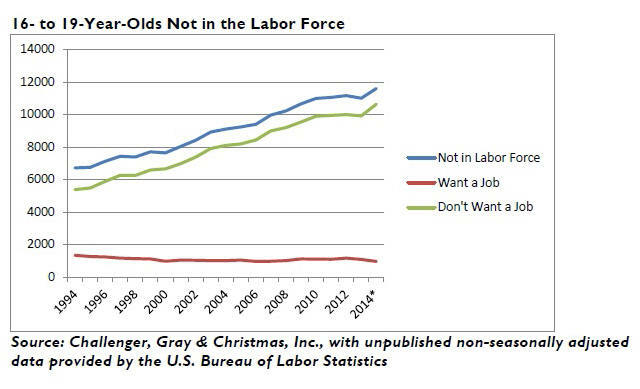 ‘Teen Summer Job Outlook Teen Employment Culd Remain Flat as More Say “Nah” to Summer Jobs’, Challenger, Gray & Christmas, Inc., April 28, 2014.